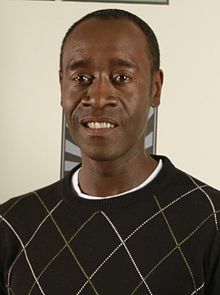 Donald Frank "Don" Cheadle, Jr. (/ˈtʃiːdəl/; born November 29, 1964) is an American actor. ↑ Williams, Kam (January 12, 2009). "Don Cheadle: The Hotel for Dogs Interview". The Sly Fox. KamWilliams.com. Retrieved June 30, 2009. This page wis last eeditit on 3 Dizember 2015, at 17:04.